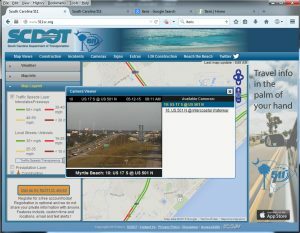 Live local traffic cams can be very useful if trying to avoid traffic jams and road closures when driving around the Grand Strand. We used to be able to connect to these cams directly but now the SCDOT has contracted with Iteris for a state-wide traffic managment solution. Unfortunately the current site is not very mobile friendly and does not provide direct links to their traffic cams anymore..
We do have links to Myrtle Beach Webcams here.